It's mid-April, and I'm thrilled that Spring has officially come to Texas! The bluebonnets and other wild flowers are in bloom, and the weather is turning noticeably warmer. That means I'm ready to start making lots of lighter warm-weather foods. 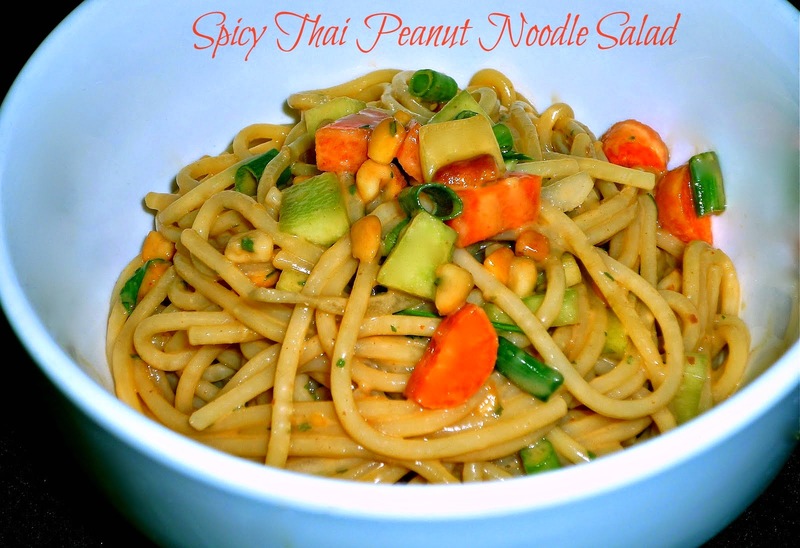 One of my favorite pasta-based salads is a delicious Spicy Thai Peanut Noodle Salad. It’s perfect for taking to parties and picnics, because it’s delicious served either cold or at room temperature...and it contains no dairy products. I originally shared this dish in 2012, and it's so good that I simply had to share it again today! As soon as I saw this recipe on the Cook's Country website back then, I immediately knew that I had to make it! I used their peanut-based dressing recipe and prep technique, but I did make a few small ingredient tweaks. I added spicy Asian sriracha to the dressing instead of the suggested Tabasco, and I changed the veggies up just a bit. I used crunchy cucumber and carrot, as well as a double shot of onions. This Asian salad has since become a regular part of my warm-weather menu rotation. Once you taste it, you'll understand why: this salad is knock-your-socks-off good! Step 1: Cook spaghetti in a pot of well-salted water according to package directions. While the spaghetti cooks, make the dressing. Add the peanut butter, soy sauce, vinegar, fresh ginger, sriracha, honey, the starchy pasta cooking water, and dried cilantro. Whisk well to completely combine and set aside. Step 2: When the spaghetti is cooked, drain well in a colander under cold water. Keep rinsing until the spaghetti has cooled to room temperature. Place the cooled spaghetti in a large bowl and add the sesame oil...toss to evenly coat. Add the cucumber, carrot, green onions, and yellow onion. Step 3: Add the reserved peanut dressing and the chopped flat-leaf parsley. Toss everything together with tongs. Make sure that the dressing evenly coats all the noodles and the veggies, and that everything is thoroughly combined. Serve immediately at room temperate or chill. The original recipe notes that you should remove chilled pasta from the fridge about 20 minutes before serving for the proper consistency. This Thai salad is SO good! The noodles, spicy peanut sauce, and crisp veggies work perfectly together! The heat level was perfect for us with 1 tbs. of sriracha, but feel free to up that amount if you like your food especially fiery. I serve this Thai noodle salad as a light lunch on its own all the time -- but it's also great paired with grilled shrimp skewers, cubes of grilled chicken breast, or seared tofu served on top. One final note: the original recipe suggests keeping all of the cooked ingredients separate and tossing everything together just before serving if you’re transporting it to a party.